Malala Yousafzai is a Pakistani girl from a Muslim family, who has become an activist for the right to education for girls, who are discriminated against and prevented from obtaining education because they are women or because of various cultural, religious, or political reasons. She also advocates for those who risk their lives, as she did, just by going to school. As a result of her activism, begun when she was eleven, at age fifteen she was attacked by a member of the Taliban who shot her several times; although she miraculously survived, she partially lost her hearing. So she has become the symbol of struggle for the other 57 million children in the world who have no access to education. Malala has asked that we take a photo with a raised hand, addressed to the UN, and post it on the various social media networks to demand that education be considered a priority for the UN and all humanitarian organizations in the world. I invite you to join this campaign so we can become an extension of that brave young woman and help in her efforts to train children for life, which is making a better world. With this writing I publish my petition, later I will place my picture in Facebook, Twitpic, Twitter, Windows Live, YouTube, etc., as well as on the right side of the blog to continuously ask the United Nations to institute education as a priority for everyone from early childhood. We support the work of this girl, as did the former British Prime Minister Gordon Brown, who was photographed with his hand raised, declaring “I am Malala.” Become an activist for the rights of millions of boys and girls children to education. 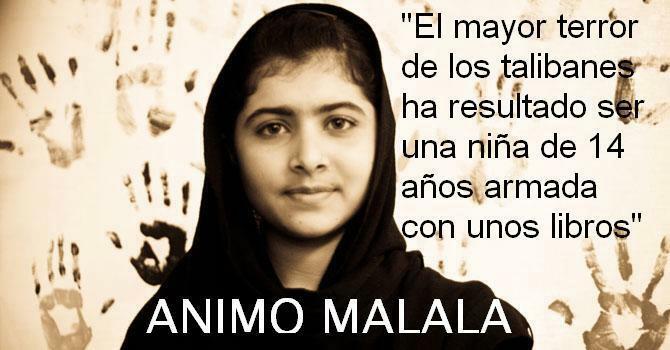 Be more than an activist: Be like Malala! Join us! Author Rosa María Rodríguez TorradoPosted on September 14, 2013 September 14, 2013 Categories Eduardo Herrera, Translator: Tomás A.